I like looking at sibling names. You can usually learn a lot about the parents by looking at sibling names. There's usually a similar sound, or feel, and you can see what was important to the parents. What their style is like. Maybe all of their kids have names from the bible. Maybe they all start with the same letter. Have the same number of syllables. Have repeating double letters. Are contemporary. Are spelled uniquely. Growing up, I had a lot of friends where all of their siblings had names that started with the same letter. Some of them have followed the same trend with their children, while some have not. I have friends with very common/popular names who gave their children more unique names. I have friends with unique names who gave their children more popular names. And everywhere in between. I think Tom and I have narrowed down our style, which is good because naming a baby is hard! We have a few rules that we like to follow while we're picking a name. We've by and large ruled out any name that ends in "son" since our last name does too. Which is too bad, because I always loved the name Jackson. However, we really didn't want a Jackson Spearson. Too cutesy. And although I love names that start with vowels (because I think it accomplishes the soft sound I like), and although there are many, MANY names that start with E that I love... this baby's name will not start with an E. Mostly because I refer to our one year old on here as E, and having two of them would be confusing, but also because some people in real life call him E. So for now, I've decided that having two E's won't really work. We reserve the right to break this rule in the future, but for now it's one we're trying to follow. Another rule we're trying to follow? No top 10 names. So you can bet that this little baby will not be named Emma, Noah, Olivia or William. No Charlottes (no matter how much I love that name!) or Benjamins... no Isabellas or Jacobs. One thing that is for sure - we won't be announcing the name until this little one decides to show up. (Sorry!) Partly because we're not looking to be talked out of our choice, and partly because we may change our mind! Little E's name wasn't finalized until after he was born - in fact we were debating it with the nurses and our doula while I was in labor! Although this time around, it seems like we'll be doing less debate on the first name, which seems pretty solidified at this point, and more debate on the middle name! We have a few we're considering, but I'm not sure we can say we have a front runner yet. I'm having a hard time deciding what's harder - the first name which has infinite possibilities, or the middle name which due to our want to keep a family name, only has so many options. They both definitely have their own challenges. Speaking of sibling similarities.. what do you think? 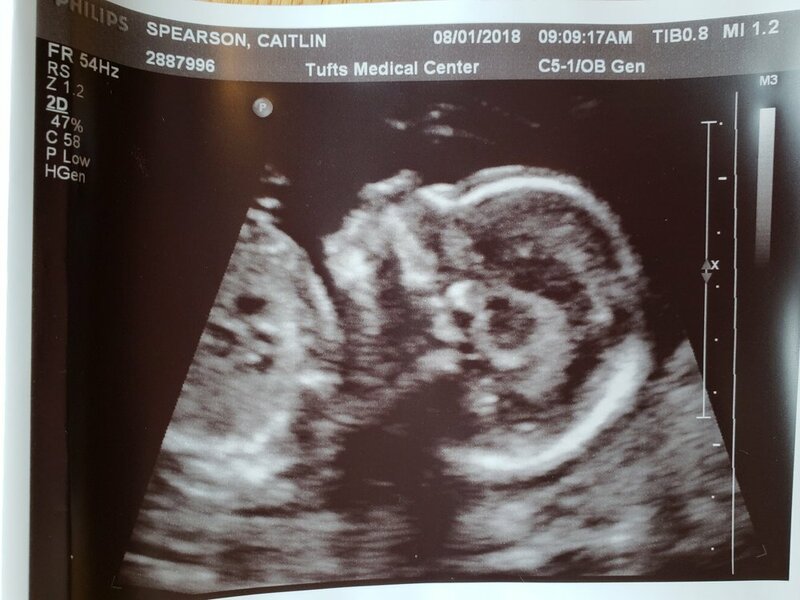 E is on the left, and baby #2 is on the right! Both are taken at exactly 19 weeks.